From $4.00. Ready same day. 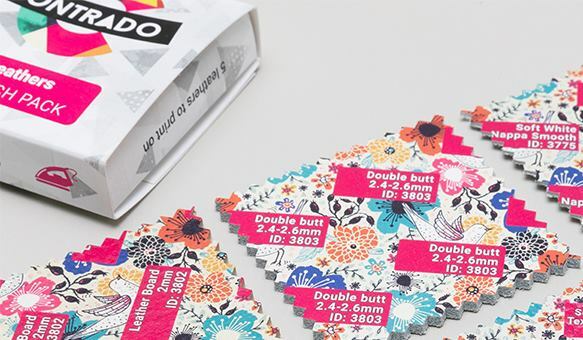 See our full range of fabrics to print on in one handy little pack. Make sure you choose the perfect fabric for you for printing with this handy pocket fabric swatch pack. Select from four packs of fabric swatches; Classic, Natural, Leather and Paper. Each pocket-size fabric swatch pack comes with a selection of fabrics from our extensive collection of 110 fabrics. This pack gives you the opportunity to see and feel our custom cloth and print quality before you buy. Selection is easy as we print the fabric name and a reference number on each swatch. If you buy a swatch pack, we issue you a coupon code to a great discount on your fabric or leather order*. Our range of 4 fabric swatch packs are here to help you make an informed decision as to what fabric will work best for your projects. 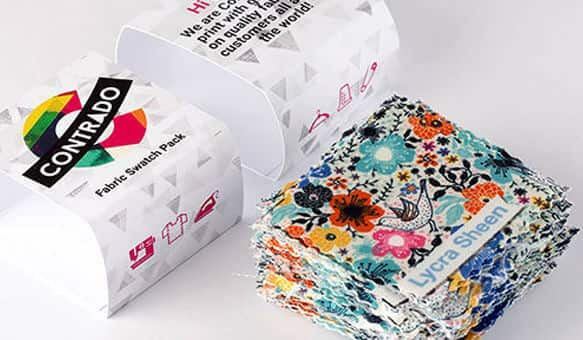 Each swatch pack features a fun and vibrant print on each of the fabric samples, to show you how a print will come out against the different surfaces and compositions of each fabric. This selection features our wide range of man made fabrics. From stunning polyesters and luxurious lace to sumptuous velvet and contemporary neoprene. There are so many unique choices, that you might find yourself ordering a bundle of fabric samples to try out. The natural selection features our collection of beautiful natural fabrics. Featuring the likes of organic cotton, half-panama, linen and real silk, these naturally gorgeous fabrics will breathe new life into your creations. The leather swatch pack is made up of 100% real leather. Our specialist printing method gives high-quality color reproduction and fine detailing up to 2 pts. With leathers from both goat and cow, you are bound to find something that has the grain and the texture that you are looking for. As well as fabrics, we also offer a bespoke range of customized papers. Thick and luxurious paper with a textured face, glossy satin finished paper and even a selection of wallpapers; you will love how your designs look printed on these chic paper options. For a full list of the fabrics that we have to offer and their names, in multiple languages please click here. When you get your pack in your hands, you'll see there's an ID reference number on each fabric swatch. Use this number to look up each individual fabric on our website. Just enter the number into the search bar on our full fabric range list to see the properties, uses and fabric information. You can also enter the name of the fabric, as an alternative to using the ID number. Purchase a Swatch Pack and receive a $10 gift voucher to redeem against your next order of fabric or leather prints. *voucher cannot be used for test prints or samples. Minimum spend: $25. This offer is for new customers only who have not previously ordered with us before. Voucher can only be used once and expires after 30 days. Very Helpful I like the color samples. They are very helpful when picking what to print on however, I was looking for the knitted sample and I have not been able to locate that in the sets I bought. Also, I am not sure if the back of each material sample will look the way the sample does. AWESOME customer service and fast turnaround! The product and customer service was professional and fast. I am very excited about working with the company. Excellent service Ordered samples of 7-8 different fabrics with different designs and had them in just a few days. The work is great--colors look super and the speed with which the work was done was amazing. Thank you SO much. Very pleased with those samples I ordered those fabric samples and received them very quickly, they were very well packed and beautifully presented . Each one of them is also very easily identified, which makes life much easier. Very professional. great variety of fabrics Fast shipment. Many choices of fabrics. In the Natural pack, I was a bit disappointed at the softness of the cottons. Only a few had a fluid drape. I haven't washed them yet, so that may change. SWWWATCHES They’re all GREAT! High quality awesome swatches!! Swatch pack So many swatches!! Love that they are printed with artwork and fabric names. No other company has this selection with this printing on their swatches. Really nice touch. Also came within a few days of ordering. Great! Prompt Impressive selection of fabrics, prompt delivery of both swatch books and my test print. Very nice printing, nice black saturation, crisp. I can't wait to order I received samples right on time. Super nice presentation and it will be easy to place an order because they are well marked. Fabic Sample What an awesome way for me to select what fabrics to print in the future. Thank you VERY much for sending them so quickly. I was amazed! I am very impressed with the quality of what you offer. THANK YOU! Are all the fabrics inside the swatch pack? You can choose from the Classic, Leather Natural and Paper swatch packs. We have a wide range of fabrics to print on and the packs show the whole range. All 100 examples are included, apart from a few specialist fabrics, such as the 0.12" felt, printable leather and our needlepoint tapestry. These are hard to accommodate due to their format mass, but you can order tests prints directly of each. Is it clear which is the heavier of the fabrics? We think that by having the samples and simply handling them personally will tell you so much about our range of custom fabrics, including the weight, and texture. If you can't decide by handling the fabric, then you can check out the specific fabric product page on the website for further details, or make a custom test print. Is the print example a good representation? We think that the print example is a very good representation. We use a design that has solid full color and fine detail. 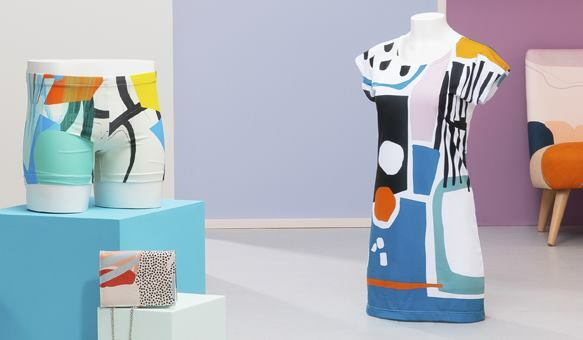 The samples give a full representation of what the print quality is like on each textile. The surface textures very useful when deciding which to pick. You can try a test print as the next step in your selection.